This is a great similitude and fits for most IT projects. In this post, I would like to tell you about a project of mine which is different at the beginning. Normally customers may request features that are contradictional, those contradictions are eliminated during project design in co ordinance with customer. One of our customers requested us a project. It was a modification on an existing assembly line which was developed by our team. 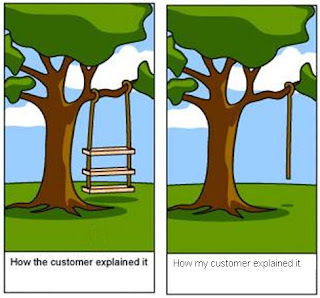 On the left, how most of the customers explain their request. And on the right, my customer. A warning light lit in my mind, it may be risky without handshaking clearly. Something was wrong. Well, no more information. Just all, we had to guess what customer is really requesting. It’s the average time needed to produce one product, and it is same for all stations because all stations are cascaded to each other. - Where are the most inefficient stations? (This is different than bottleneck. Some stations may cause scrap and it is possible to detect if any station is producing more products than final stations output. In most cases, data collecting terminals are placed on assembly lines to collect number of products and operation times, but ,in this project customer did not want to add anything. We had approximately 70 stations with operators. Operators have pushbuttons to send the product to next station. We were going to take necessary information from this buttons and existing sensors. As you see, some customers may have contradictional requests, and some have none. We are going to start to a new series of a case study, collecting operation times from assembly line. We are going to tell about how to analyze the project and how to design. I would be glad if you comment on this post, especially what would you like to see in the case study.